Unsung Hero of 9/11 | Inspire One. But a morning that began with him preparing meals for the people at the Fiduciary Trust Company suddenly led to him becoming as brave as any first responder. A Fiduciary official would later credit Clark with saving hundreds of lives as he made sure that everyone in his department along with everybody else in the company’s 96th floor offices in the South Tower was safely exiting the building. He then paused on the 78th floor to assist a woman in a wheelchair. The mother would ascribe some of his courage to him having been a Marine for eight years. “My son was a Marine, so you know he wasn’t going to leave anybody behind,” she says. “He was always there to help,” his mother says. Upon seeing others suddenly in the most mortal danger, his everyday decency had become uncommon courage. A chef known for his fabulous meatloaf and for remembering everybody’s name and favorite meals had proven as courageous as if he had stepped off an FDNY rig. And it does not detract in any way from the bravery of the first responders to say that there were numerous courageous civilians in the towers. “There were a lot of heroes that day,” Elsie Clark says. During Wednesday’s 9/11 memorial, victims’ loved ones pay tribute to those they lost. In the aftermath of the attack, many Marines would show similar courage in Iraq and Afghanistan. And many seemingly ordinary civilians would demonstrate astonishing bravery at the Aurora movie theater shootings and the Sandy Hook school massacre and the Oklahoma tornado and just about any other place where horror suddenly struck. Again and again, people threw themselves upon others in an effort to shield them. We have seen it so often that it seems to be at the core of what it means to be a true American. What we rightly admire in Marines and firefighters and cops and others who race into harm’s way is also just an emergency away from arising in people who otherwise give only hints if it. The reflex to hold a door for the next person coming out of a store or offer an elderly person a seat on the subway can in other circumstances propel you to jump in the way of gunfire. And it is not only right to honor a courageous chef and the other civilians who showed such bravery on 9/11 along with the firefighters and cops. 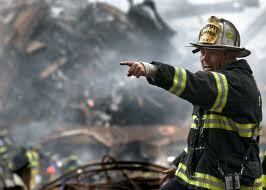 It is important, for these other heroes are people we can and should emulate. Their example shows us what we all can and should be, whatever else we are in life. The enormity of Benjamin Clark’s sacrifice is made apparent by the photos of his own five children hanging in his mother’s home. He had been happily married to a wonderful woman, LaShawn Clark, and he had been the happiest of dads. She says that her grandson, Taj, had awakened at 4 a.m. on 9/11 as his father was getting ready for work. “Taj woke up and told his dad, ‘Don’t go to work today. I don’t have a good feeling today,’” she says. Benjamin Clark had told Taj to go back to sleep, as it was the first day of school and he would need his rest. The father then set off for his job, arriving before dawn at his kitchen on high. Elsie Clark was at her own job as a school crossing guard at 7:30 a.m. She greeted the youngsters as they returned after the summer holiday in their back-to school clothes on a beautiful morning. A man then burst from the school to tell her that a plane had hit the World Trade Center. As evening approached, she stood in front of her house and gazed up the street down which her son always walked from the subway. He did not appear. More than 1,200 people attended his memorial service at the Marriott in downtown Brooklyn. They included people who were alive only because he had urged them on to safety. “My pastor said he had never seen a memorial like that,” Elsie Clark remembers. She held a much smaller ceremony in the front yard, and a minister blessed the permanent brick and stone memorial. She began the ritual of hanging the banner at midnight every September 11. Until her retirement two years ago, she spent the anniversaries of 9/11 at her post as a crossing guard, making sure children got safely to school. “There was a lot of times I stood and cried on that corner, but there was a lot of support,” she says. She watched youngsters toddle toward their futures just as her son had. Her husband, also Benjamin Clark and an army veteran, never recovered from the loss of his son. He died suddenly in 2006, as if the burden of his grief had become too much to bear. She can attest that there is no closure when you lose a child. At the approach of the 10th anniversary of 9/11, she went down to Ground Zero and stepped up to the memorial pool that marks where the South Tower stood. She ran her fingertips over her son’s name inscribed in section S-39. “I felt like that was his tombstone,” she recalls. She liked that his section happens to be on a corner, close to Liberty Street. “Look at him, he’s hanging out on the corner as he always would, hanging out with the girls,” she remembers saying. She hung a rubbing of his name on her living-room wall. She sat home on the 11th anniversary as family and friends called to say they were thinking of her and her son. “The phone be busy,” she said. At the approach of this 12th anniversary, she sat on the porch overlooking the front-yard memorial and heard four gunshots. She learned that somebody had fired at a man pushing a stroller and ended up killing a 1-year-old boy. The gunman was later arrested and said that he wished he had changed the course of his life back in elementary school, before he took what he called “the wrong path.” He might have if he had followed the example not of the fake tough guys who join gangs but a genuine tough guy such as Benjamin Clark, who went through school and served in the military and went to work every day and was a loving husband and father, who was another kind of hero long before he became one on 9/11. Elsie Clark knows there was been talk of naming a Brooklyn street after the rapper Biggie Smalls. She stood outside her home on Saratoga Avenue on Tuesday saying that her own street could rightly be named Benjamin Keefe Clark Avenue. “Just this block,” she said. A neighbor across the street affirmed that the honor was well deserved, and not just because of how Benjamin Clark died, but also how he lived. “He’d never let me pick up a snow shovel,” she said. “I’m going to get myself ready to go vote,” she said. At midnight, she would once more be hanging the banner on the fence beside the memorial which has not one but three American flags, as befits a country with so many heroes.